Wish you all had a wonderful Christmas with the loved ones, and tons of delicious homemade food. Ah..how much I miss the freshly baked bread dipped in gravy made from the rotisserie chicken drippings when living in Minnesota. Such mouth watering feast does not come easily. All the prep work, cooking process, especially the cleaning afterwards can be time consuming. It's time to take a break but without sacrificing the joy of eating yummy homemade meal. 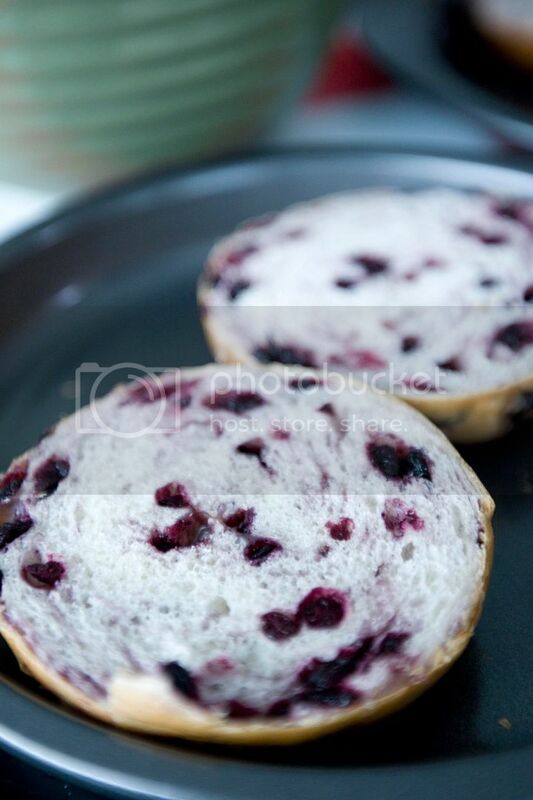 A couple store bought blueberry bagels and high quality jam can save quite some efforts when preparing a simply meal for two. 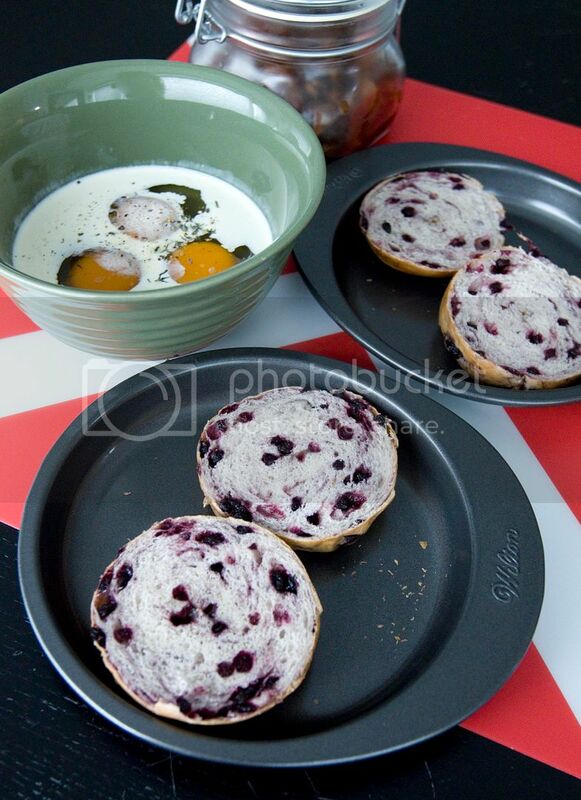 Cut each bagel into two equal halves then transfer to a baking dish, cut side up. Heat them up in the oven with medium high heat, till the edges turns slightly crunchy or till desired texture. Once ready, spread some cream cheese while the bagels are still hot. Pinch the tip of the thyme sprig with one hand. In the other hand, run the fingers down to the bottom to get the leaves. Give them a few rough chops if the falling pieces are too big. Beat the eggs together with 1 tablespoon of heavy whipping cream, tiny pinch of salt, tiny pinch of black pepper, and some thyme. Add the butter to a pan and turn to medium heat. Once the butter melts but not bubbling yet, pour in the egg mixture and stir constantly to prevent the bottom from hardening. Soft and creamy texture is what we are looking for so the cooking time is fairly quick, less than 1 minute. The eggs should still look semi-runny, kind of resembles soft cheese when ready. 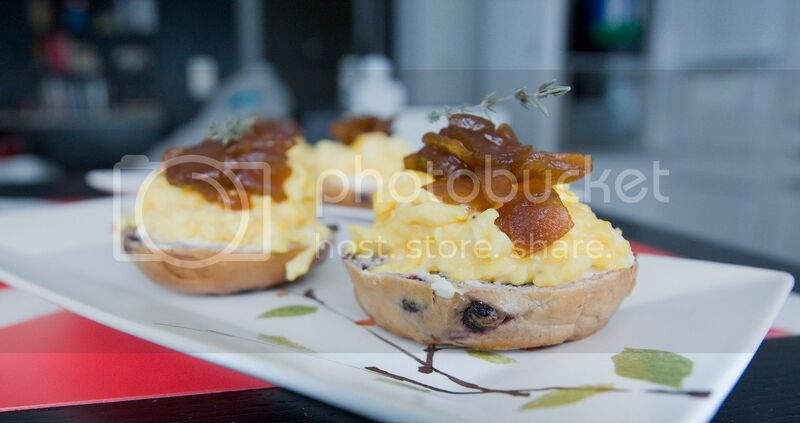 Scoop out the lightly scrambled eggs and add to the bagel halves. 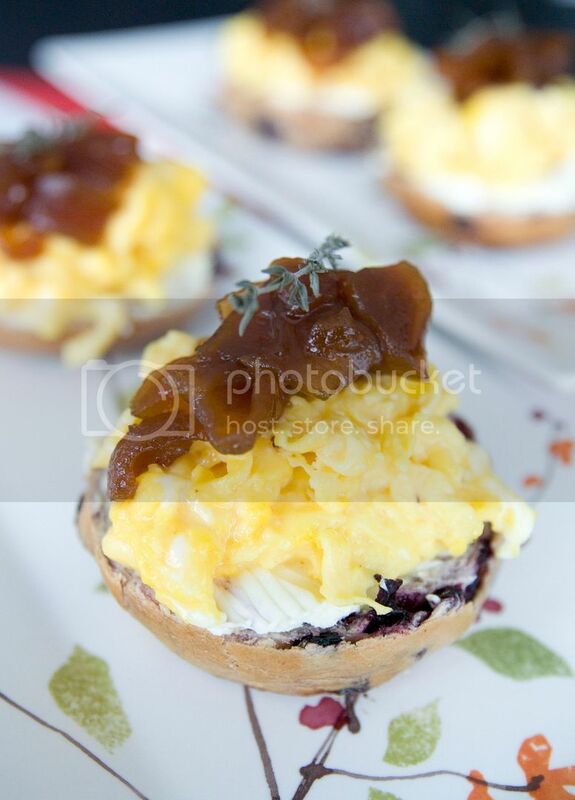 Add a spoonful of apple preserve or other type of jam on top of the eggs then garnish with thyme sprig. I got the apple preserve from my friend, which she used palm sugar instead of regular granulated sugar when making it - that's why the darker color. 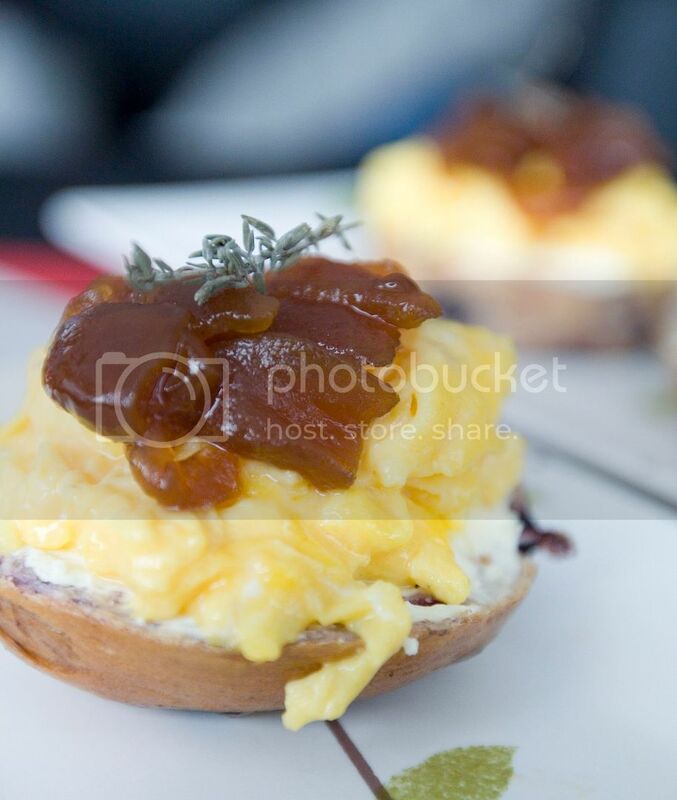 Can you see the creamy texture of the lightly scrambled eggs? It might take a few practices in order to get the right consistency. However, I personally think it's better to under-cook the eggs than having tough and drier version for this bagel recipe. Now that Christmas has passed, are you ready for New Year's celebration? Happy New Year! Wish more joy and delicious food to come!